Crater Lake was one of the places I had been looking forward to the whole trip. It's a national park that I had never heard of until someone put it on our map. Then I saw pictures. Then I found out that it was the deepest lake in the United States. Awesome photos and facts about Crater Lake kept finding their way to me and the anticipation of seeing this incredible place grew and grew and we got closer and closer. 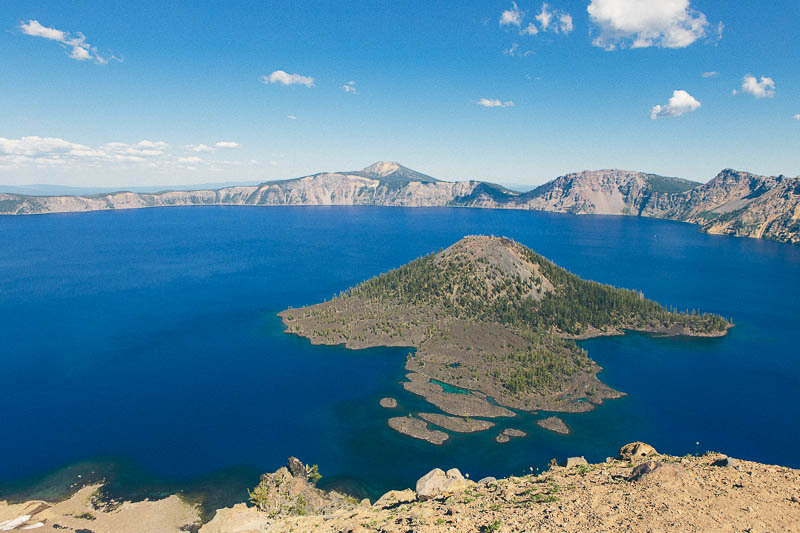 Crater Lake was formed 7,700 years ago when a volcano erupted and left a gaping, 6 mile wide hole in what would eventually be south-central Oregon. 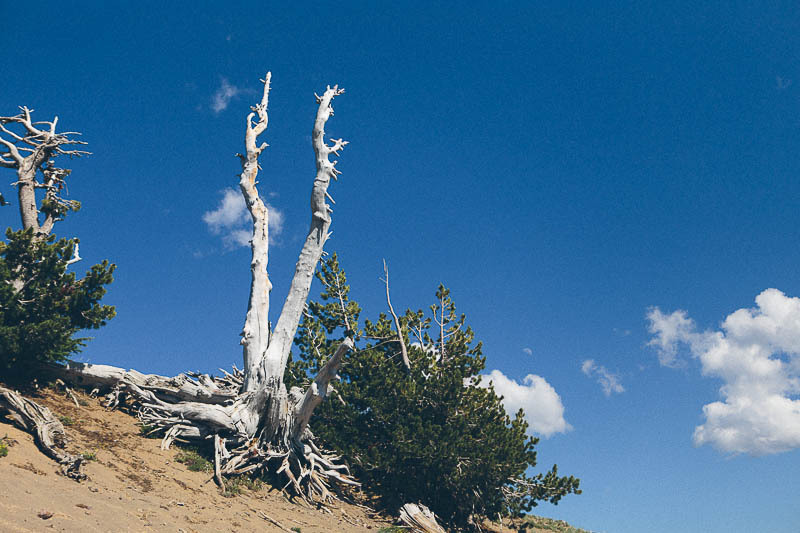 Over those thousands of years, snow melt and rainfall filled the caldera. 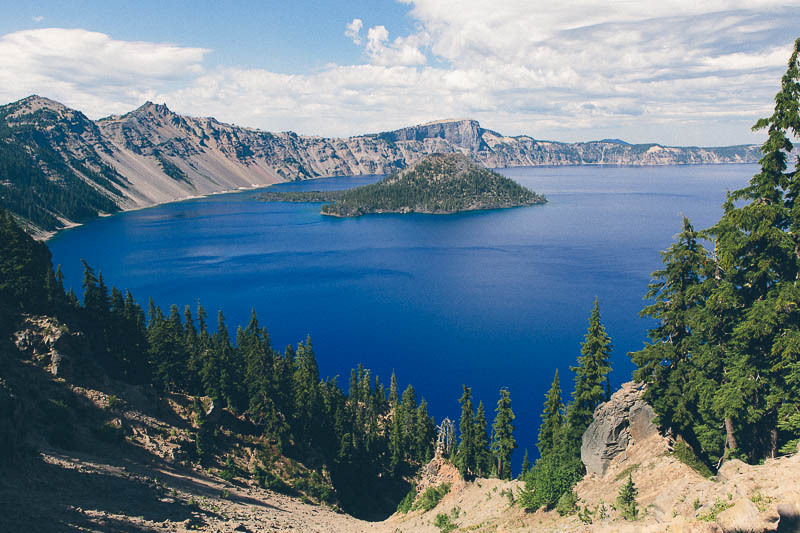 There are no rivers that flow in or out of Crater Lake, so the pollutant-free water is extremely pure, intensely clear and deeply blue. 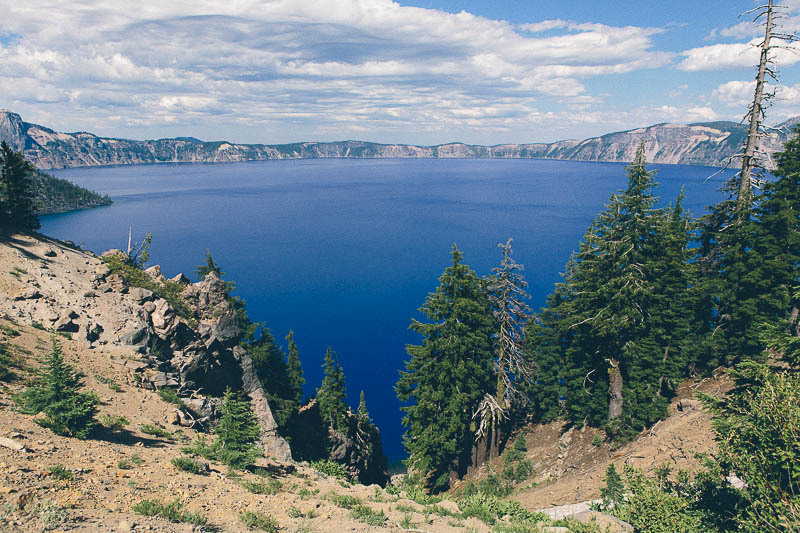 At 1,943 feet, it's the deepest lake in the United States and the seventh deepest in the world. How cool is that?! We were lucky to visit in mid-July; the snow doesn't usually melt until early July. 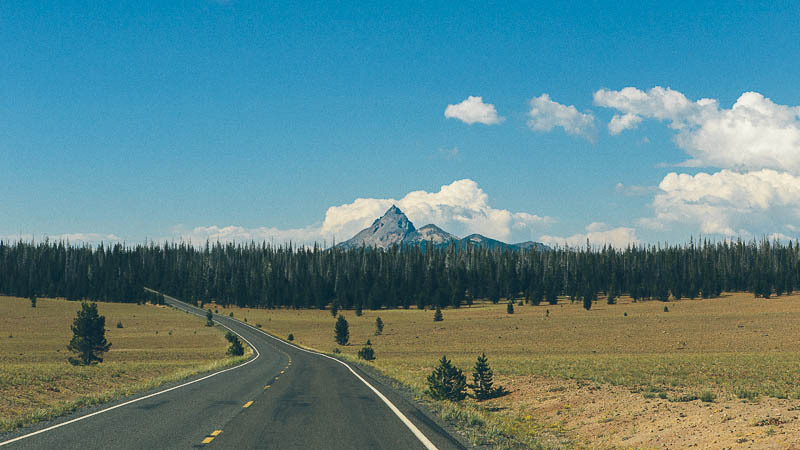 This particular area of Oregon gets an average of 488 inches of snow every year. That's 44 feet of snow per year. And an average of an inch and a half of snow every day. There's a photograph in the visitor's center showing the record snowfall of 17 feet in 1952. THAT'S BANANAS!! I think it's safe to say…don't go here in the winter. Both fortunately and unfortunately, our time spent at Crater Lake was very brief. It's kind of in the middle-of-nowhere Oregon. And it's a total internet dead-zone. It was a weekday, we had to work, so we decided to make a detour through the park on our way from Klamath, CA to Bend, OR. We were running low on gas by the time we go to the park entrance, not realizing that we had passed the only diesel fuel pump within 50 miles about 40 miles back. We would only be able to drive around half of the lake and then pray that we would be able to make it to the closest gas station. But by the time we caught our first glimpse of the brilliant blue of the deepest and purest water in the continental U.S., it didn't matter. 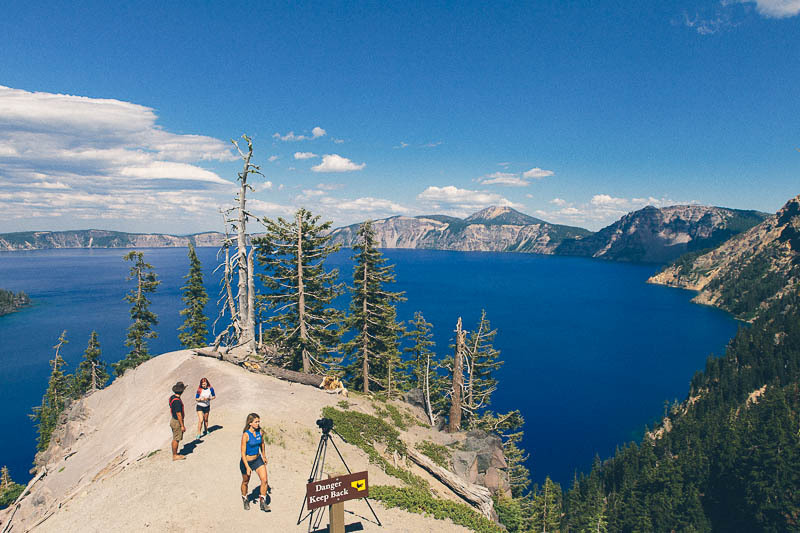 We pulled off at every scenic overlook to snap a few Instagram-worthy photos, but we became so mesmerized by the intensely calm and blue water that we had to put our cameras down and just breathe in the beauty and purity of Crater Lake. 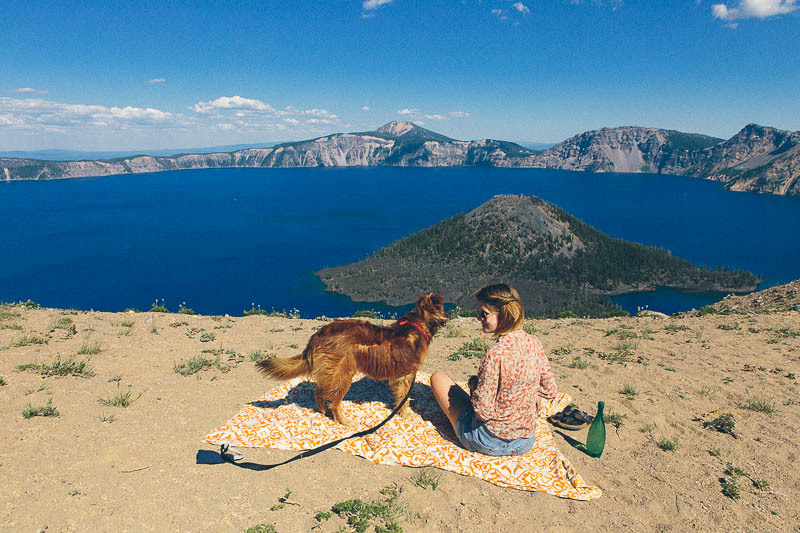 At one particularly gorgeous overlook, we gathered picnic supplies and a blanket and had a lunch of sliced summer sausage, cheese, apples and crackers on the edge of the lake. It was by far the most blissful picnic of my life. You know that scene in "Sound of Music" where Julie Andrews is singing "The Hills are Alive with the Sound of Music" and frolicking through that alpine meadow? It was like that. But with a way better view. And snacks. During this trip, John and I find ourselves saying "I really like our lives" very often. This was a major one of those times. It was a Monday afternoon and we were picnicking on the edge of one of the deepest lakes in the world. It was hard to pry ourselves away from our idyllic picnic spot, but we had to keep on keepin' on. We unfortunately didn't have enough time for any hikes and had to get some gas before heading to our campsite in Bend before it got too late in the day. Although sad to leave such a beautiful and special place, we were thankful to find fuel and a cell signal. We made it to our campsite just south of Bend in time to settle in and finish up some pressing work deadlines. Definitely one of those times I wish this trip was an extended vacation where we didn't have any responsibilities and could spend weeks in the woods, exploring the nooks and crannies of Crater Lake. Special thanks to Paul p. (who suggested See sunset and sunrise at the Lake, it is pristinely beautiful!!!) for making this blog post possible!